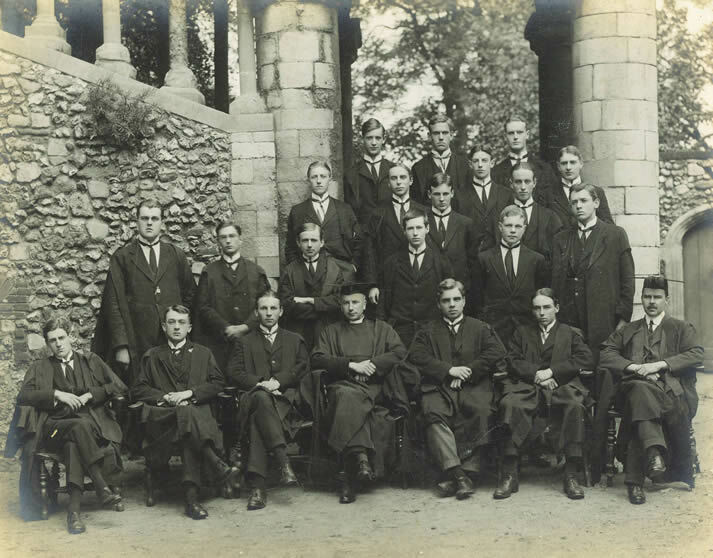 The Sixth Form 1914 BW Galpin, TR Juckes*, JAR Ferguson*; GWH Burton*, GJ Eccles, LG Robertson, LWHD Best, A Lindsey, JE Witt; FC Gentry, AGD West, RJ Routh, GLD Davidson, GH Crosse, RJ Mowll; LW Goldsmith*, A Sargent, RSF Cooper, Revd CRL McDowall, GEJ Gent, WJ Potts*, Mr GA Purton. Charles Pullan, who entered the Sixth Form in 1912 and left in July 1913, described it in his memoir Schola Mea, published in 1916. The Sixth Form are a great body. It is most instructive to sit up in the Sixth Form Room, and, while you plough your turgid way through the authors, which an obdurate examining body at Oxford demand that you should know before you enter the sacred gates, hear a Classical master of erudite learning discuss with a few of his disciples, the question as to whether Phyllide or Glycera, or any other member of the Roman beauty chorus whom Horace admitted, were wont to wear a fillet or not when they called to see him. Bernard Galpin: left July 1915; Royal Navy. Roland Juckes: left July 1914; Royal Sussex Regiment. Killed 9 May 1915. Ross Ferguson: left July 1914; Royal Sussex Regiment. Killed 9 May 1915. Geoffrey Burton: left October 1914; The Buffs. Killed 8 July 1916. George Eccles: left July 1914; Royal Sussex Regiment; served in France, India, Palestine, Egypt and Somaliland. Lennox Robertson: left November 1914; Gordon Highlanders, MC. Leslie Best: left December 1914; Royal Engineers; wounded, MC. Archer Lindsey: left in December 1915; Royal Field Artillery; served in Palestine and France; wounded. John Witt: left July 1914; Royal Army Service Corps. MC. Frederick Gentry: left July 1914; Jesus College, Cambridge. Arthur West: left March 1916; Royal Navy Reserve, Royal Flying Corps, Royal Air Force. Richard Routh: left March 1916; Trinity College, Oxford. Gerald Davidson: left October 1916; Royal Engineers. George Crosse: left October 1914; Green Howards. Robert Mowll: left July 1914; Trinity Hall, Cambridge. Lewis Goldsmith: left July 1914; Yorkshire Regiment. Killed 5 November 1916. Alec Sargent: left July 1914; St Edmund Hall, Oxford. Roy Cooper: Captain of School (1913-14); left July 1914; Cheshire Regiment; served in France and Salonika; wounded, MC. Revd Charles McDowall: Headmaster 1910-16. Edward Gent: left July 1914; Duke of Cornwall’s Light Infantry; wounded, MC, DSO, twice mentioned in despatches. William Janson Potts: Captain of School (1914-15); left March 1915; Royal Field Artillery; Royal Flying Corps. Killed 21 September 1917. Mr Gilbert Purton: left March 1916; Royal Regiment of Artillery.